Maintenance and facility managers improve preventive maintenance scheduling and staff communications with Magnatag’s new permanently printed whiteboard systems. “Our customers tell us the boards are effective, easy to set up and easy to use,” says Magnatag spokesman, Christian Krapf. “They display and schedule preventive maintenance checks by listing each piece of equipment or location on the board." 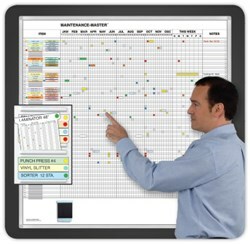 Maintenance and facility managers reduce equipment downtime and eliminate employee confusion by visually scheduling and communicating preventive maintenance activity using Magnatag’s new MaintenanceMaster® magnetic whiteboard system. “We haven’t missed a date since we began using the boards,” says a US Army Sergeant. “Now that everyone can see our maintenance schedule and what’s coming up, it’s much easier to keep track of what we are doing,” adds a New Jersey Manufacturer. A pharmaceutical company maintenance supervisor says, “We post the jobs and due dates on the board, it’s really cut down on paperwork.” “We’ve added hundreds of hours of machine availability by having our PM work displayed where we can see it and follow through,” adds a tool manufacturer from PA. The heat-fused printed porcelain-like steel whiteboards come in 4 sizes and two styles for up to 222 maintenance items. They are built for a lifetime of daily use and come in kits with everything needed to operate them. For more information, visit http://www.magnatag.com/PMF or call a Magnatag system specialist at 800 624 4154. About Magnatag®: Founded in 1967, Magnatag Visible Systems® (A division of W.A. Krapf, Inc.), designs, manufactures and direct-markets over 2,300 plain and task-specific magnetic printed steel whiteboard kits, calendar planners, maps, and other data display systems for industry, government, hospitals and schools.